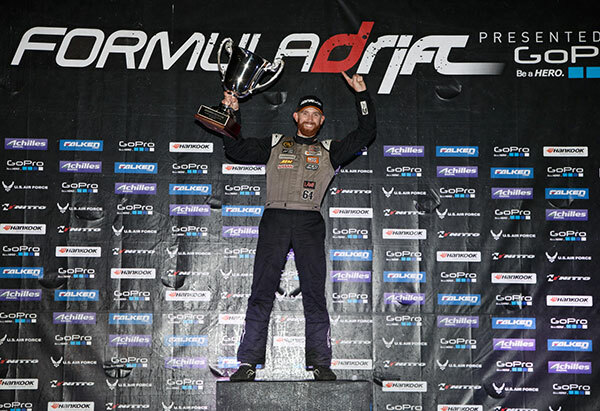 Long Beach, Calif. – October 11, 2014 – Formula DRIFT returned to Irwindale Speedway for the 2014 Pro Championship season finale. Daigo Saito in the Achilles Radial Lexus SC430 takes the event victory. Chris Forsberg in the Hankook Tire Nissan 370Z wins his second career championship. 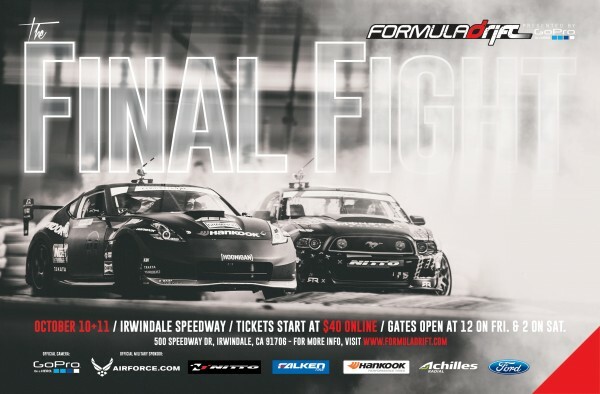 Round 7: Final Fight held at Irwindale Speedway did not disappoint the sold out crowd with an action packed weekend that featured the Pro Championship, PRO 2 Championship, Offset Kings car show and more. The Driftstream had over 200,000 unique viewers to the live stream for the event weekend. Entering the event, Forsberg lead the Pro Championship chase by a mere 26 points. As the competition progressed through the night both Aasbo and Forsberg would meet in the Top 4 to control their championship destiny. Aasbo in one of the tightest battles of the evening got the better of Forsberg for the fourth time this season in head to head battles, yet he needed to win the entire event to win the championship. The number one qualifier, Forrest Wang in the Get Nuts Lab / Hankook / STR Racing Nissan S14 went against Daigo Saito in the Top 4. In a close battle, Saito edged out Wang to make it into the Finals against Aasbo. In another closely fought battle, Saito beat out Aasbo, to win his third consecutive victory at Irwindale Speedway, having won the event in 2012 and 2013, and helping to award Forsberg with his second Pro Championship. 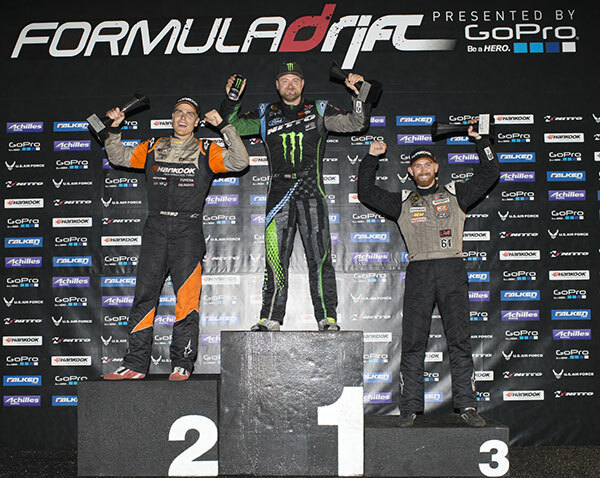 Forsberg is only the third driver in Formula DRIFT history to hold two championships with his 2009 championship and now 2014 championship. In addition to the 2014 Championship, both the Tire and Manufacturer Championships were determined at Round 7: Final Fight. Hankook Tire won the Tire Manufacturer Championship, while Scion won the Manufacturer Championship. For more information visit: www.formuladrift.com and find Formula DRIFT on Instagram @formulad, Facebook www.facebook.com/formuladrift and Twitter @FormulaDrift. As we enter the final round of competition at Irwindale Speedway, only two drivers have a mathematical chance to win the coveted Formula DRIFT championship. Round 7: Final Fight will pit the 2009 champion Chris Forsberg, who leads the standings with 493 points, against Fredric Aasbo currently sitting in second with 467 points. A 26 point difference. In order for Fredric to make up the 26 point deficit he will need to finish two rounds further in competition than Chris. This does not take into consideration qualifying points, which may play a large role in the championship this season. Example 1: If Chris gets knocked out in the Top 32 then Fredric would need to advance to the Top 8 in order to win the championship. Example 2: If Chris finishes in the Top 4 then Fredric would need to win the event to earn the championship. Again, this is without considering qualifying points in which Forsberg has averaged a higher qualifying position this season with an average qualifying point total of 6.83 points, while Aasbo is averaging 4.5 qualifying points. If the two meet head to head they will control their own destiny on the way to a championship. This season Fredric and Chris have faced each other on three separate occasions and Fredric has won each time. The only thing that is for certain is that this will be an exciting and climatic event to crown the 2014 Formula DRIFT champion. Long Beach, Calif. – September 14, 2014 – Formula DRIFT for the second consecutive year returned to Texas Motor Speedway for Round 6: Showdown. 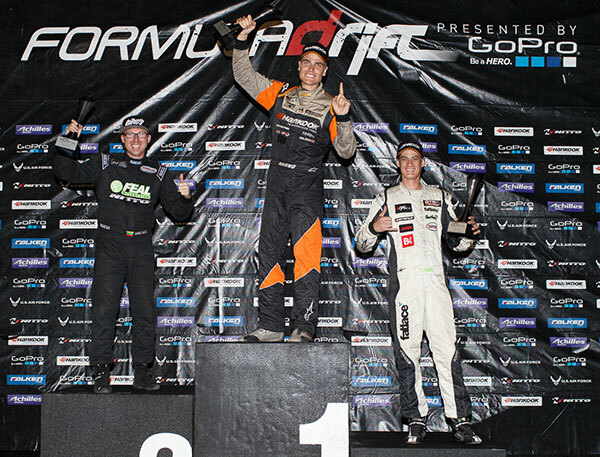 Fredric Aasbo in the Hankook Tire / Scion Racing tC takes his second victory of the season. Round 6: Showdown held at Texas Motor Speedway brought professional drifting to Texas for the second consecutive year. The event featured the Round 2 of the PRO 2 series, Offset Kings car show, and action from the Pro Championship. The weather held up on the main event day providing clear skies and cool temperatures. The final four pitted number one qualifier, Forrest Wang in the Get Nuts Lab / Hankook / STR Racing Nissan S14 against Odi Bakchis in the Feal Suspension / Nitto Tire Nissan 240SX. 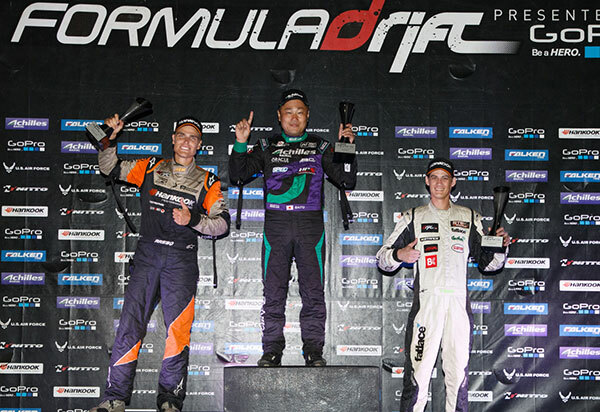 After a One More Time battle, Wang out drove Bakchis to secure his second career podium to finish in third place. Point leader, Chris Forsberg in the Hankook Tire Nissan 370Z faced Hankook Tire teammate, Fredric Aasbo. Forsberg contacted Aasbo on his chase run to give Aasbo the advantage and ultimately the win moving him into the Finals. The Finals pitted Aasbo and Bakchis. In the second run, Bakchis spun out giving Aasbo the event victory. Aasbo closed the point gap heading into the final event of the season with 26 points separating him from Forsberg as they head into the final event of the 2014 season. 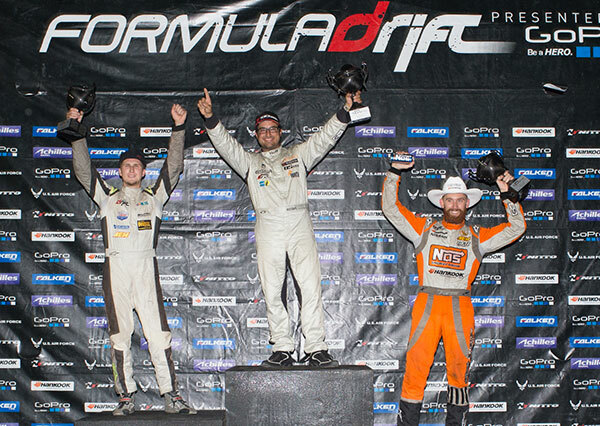 The 2014 Formula DRIFT Championship season continues to Round 7: Final Fight at Irwindale Speedway on October 10-11. For more information visit: www.formuladrift.com and find Formula DRIFT on Instagram @formulad, Facebook www.facebook.com/formuladrift and Twitter @FormulaDrift.